During the month of May, the Weinberg Memorial Library hosts its annual Faculty Scholarship Exhibit in the Library’s 5th floor Heritage Room. 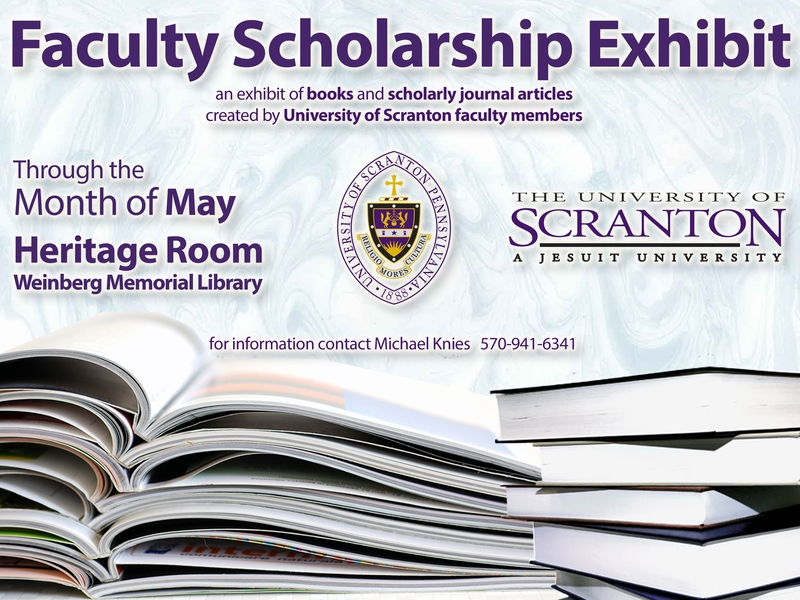 The exhibit features books and articles produced by University of Scranton faculty members since 2015. The exhibit, organized by academic department, provides an overview of the diversity and quality of scholarly accomplishments by the University’s faculty. For more information, please contact Special Collections Librarian Michael Knies at michael.knies@scranton.edu or call 570-941-6341. Comments Off on Exhibit Reception Tomorrow Night! 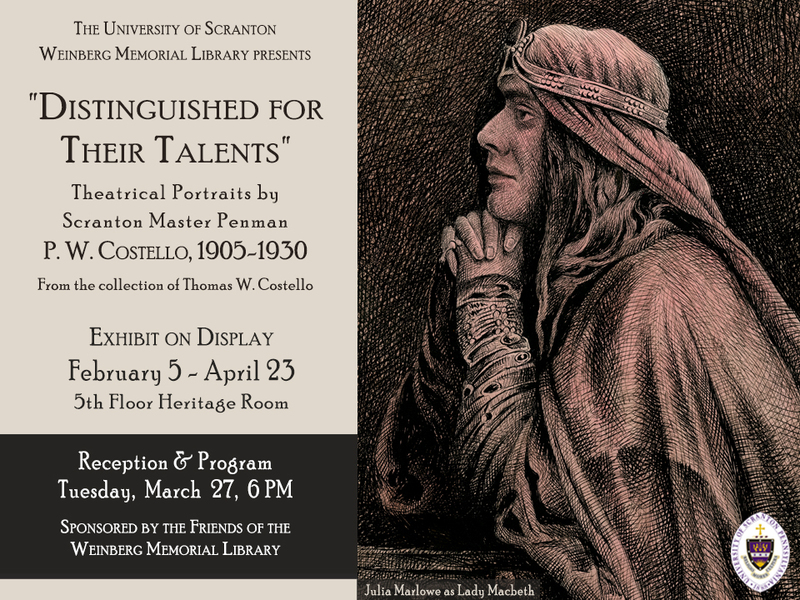 Tomorrow night, March 27, at 6 p.m. the Library will host a reception for the exhibit “Distinguished for Their Talents,” Theatrical Portraits by Scranton Master Penman P. W. Costello, 1905-1930, in the 5th floor Heritage Room. 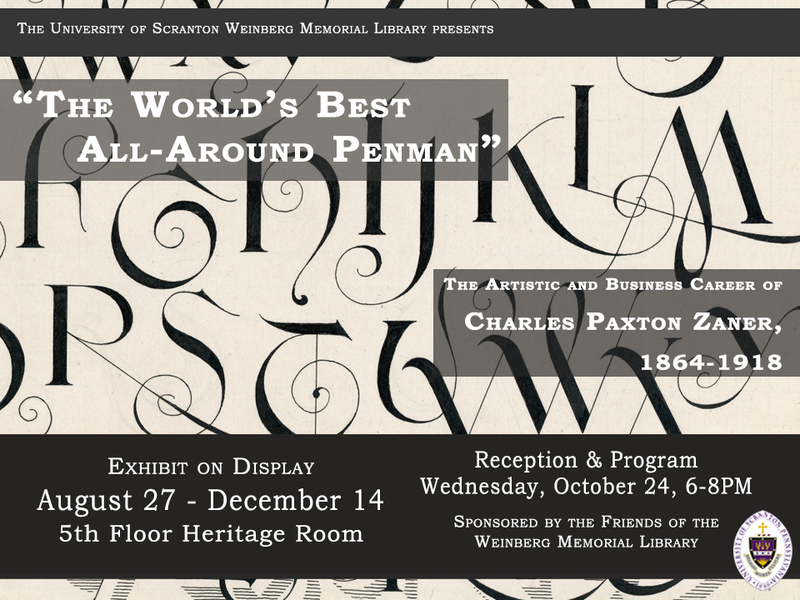 Generously sponsored by the Friends of the Weinberg Memorial Library, this event is free and open to the public. P. W. Costello’s great-grandson, Thomas W. Costello, will discuss Costello’s career, and University of Scranton professor Michael Friedman, Ph.D., will speak on Shakespearean performance at the turn of the 20th century. The exhibit will be on display through April 23 during normal library hours. For more information, please email archives@scranton.edu or call 570-941-6341. 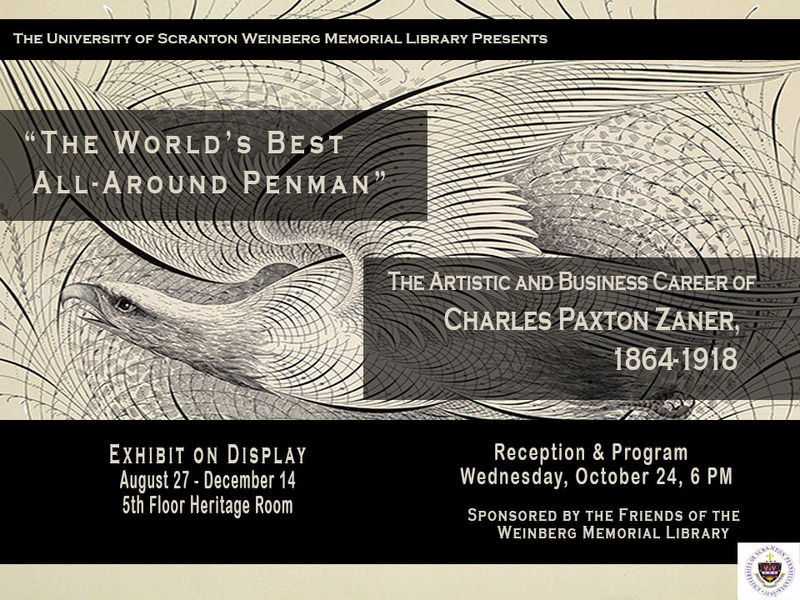 On display in the Weinberg Memorial Library’s Heritage Room is a collection of pen and ink portraits of late 19th and early 20th century theatrical personalities drawn between 1905 and 1930 by Scranton’s Master Penman Patrick W. Costello. Costello was nationally recognized for his work and operated what we might now consider a graphic arts studio where he created advertising art as well as engrossed congratulatory or testimonial resolutions, diplomas, and other types of work that required a combination of calligraphic lettering and artistic design. As a hobby, Costello drew pen and ink portraits and, because he had a love for the theater, specialized in drawing portraits of stage personalities. These were often drawn from photographs, engravings or illustrations found in theater magazines and books, but he also drew some portraits from life. In addition to his career as a penman, Costello owned restaurants in Scranton where he would display his portraits. In some cases, traveling actors would visit the restaurant and autograph their portraits. The exhibit will include a variety of men and women of the stage, some of whom played Scranton. Some actors, such as John Barrymore, are still famous today. Many of these actors performed Shakespeare and, therefore, a portion of the portraits on display depict Shakespearean characters. The Heritage Room will host an exhibit reception and program on Tuesday, March 27 at 6 PM. Thomas W. Costello, P. W. Costello’s great-grandson, will speak on Costello’s career. University of Scranton English professor Michael Friedman will give a talk titled “Shakespeare on the Stage in 1900: From Actor’s Theater to Author’s Theater.” Sponsored by the Friends of the Weinberg Memorial Library, the reception is free and open to the public. The exhibit will run from February 5 through April 23 during normal Library hours. Images of the portraits can also be viewed through our digital collections website. For more information, please email archives@scranton.edu or call 570-941-6341. 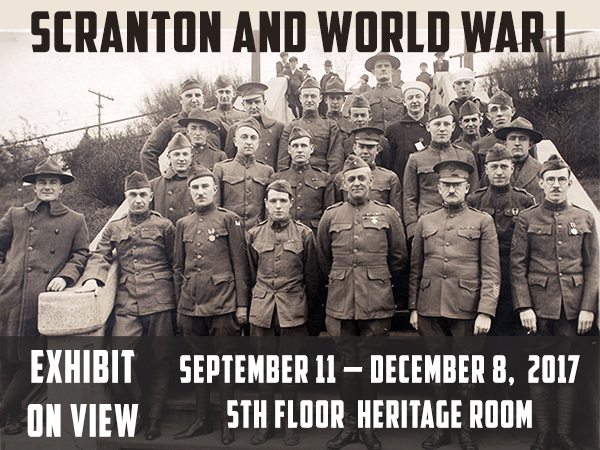 The Pennsylvania Historical Association’s annual conference begins tonight with a plenary session in the Heritage Room that will discuss the World War I exhibit currently on display. 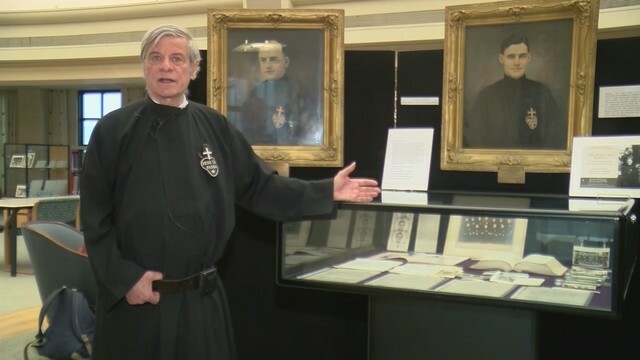 WBRE/WYOU-TV featured the exhibit in today’s broadcast, which can be viewed here: http://www.pahomepage.com/news/exploring-the-history-of-scranton/833696618. The plenary session will take place in the Library’s 5th floor Heritage Room from 7:30-9:00pm. This event is free and open to the public. The exhibit will remain on display during normal library hours through Friday, December 8th. 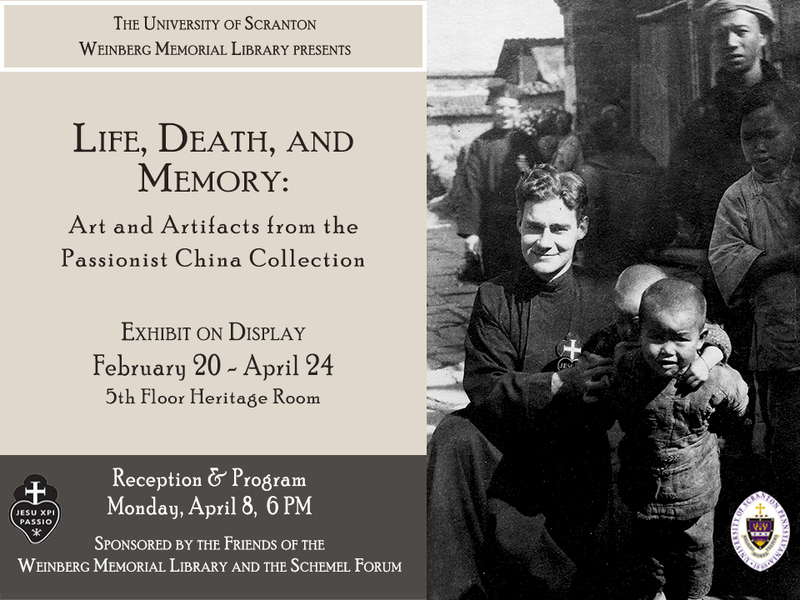 For more information, please email Special Collections Librarian Michael Knies, michael.knies@scranton.edu or call 570- 941-6341.